Magnet School Students Honor Dr. Martin Luther King, Jr.
UPPER WEST SIDE District 3 students honored Dr. Martin Luther King, Jr. On Thursday, and used the occasion to spotlight how the district’s new magnet schools are helping them achieve their dreams. Magnet school students gathered at P.S. 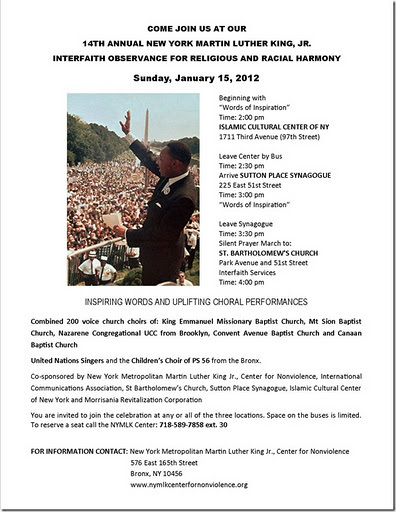 333’s auditorium on West 93rd Street to celebrate the civil rights leader with speeches, videos and artwork. But the event doubled as a sort of pep rally to celebrate an $11 million federal grant the district won to create eight magnet schools on the Upper West Side and in Harlem. Magnet schools receive federal money to create themed curricula that will attract a more diverse student body. The eight magnet schools in District 3, some of which have struggled with poor performance in the past, now have specialized instruction, new names and a focus on parent involvement. District 3’s grant lasts four years, but the improvements at each school are meant to be sustainable over the long run. Fifth grader Anthony Guerrido, whose principal said he was “a hot mess” a few years ago but has since improved greatly, delivered a speech about the STEM Institute (Science, Technology, Engineering, Mathematics) magnet school, formerly known as P.S. 241, on West 113th Street. Port Authority announces that its contracts to minority- and women-owned businesses for work on the site over the last five years have now entered the record books. Sum is 17% of total. : The Witness: From the Balcony of Room 306 – Rev. Dr. Martin Luther King, Jr. 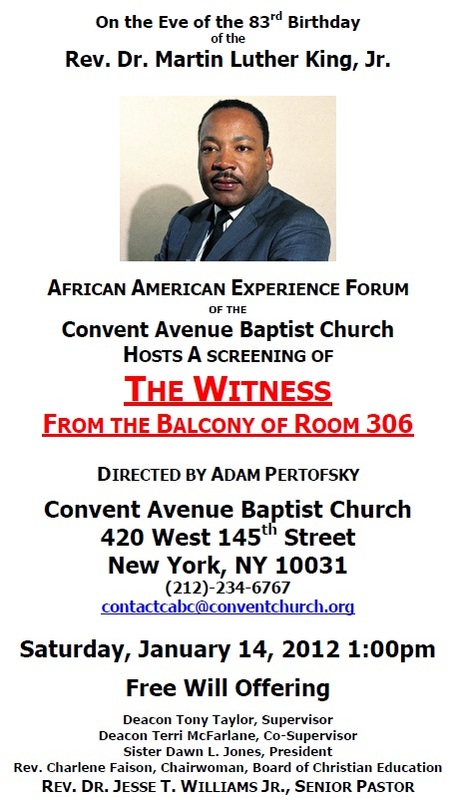 EVENT: Screening – The Witness: From the Balcony of Room 306 – Rev. Dr. Martin Luther King, Jr. Here it comes again. This holiday weekend we’ll see a lot of media coverage of Martin Luther King, Jr. Complete Coverage: TCA Winter Press Tour 2012 Independently-owned network GMC will look to launch original scripted series and reality shows in early 2013 as part of an expansion of its original programming offerings. The bill provides for only one majority-black U.S. House district out of 11 despite a Virginia population that’s one-fifth black. Ronald Reagan signed the legislation making Martin Luther King’s birthday a national holiday in November 1983. Princeton professor Cornel West and talk show host Tavis Smiley on their 18-city poverty tour on Oct.
North Carolina state workers will begin the Rev. Martin Luther King holiday weekend with the annual observance of the civil rights leader’s accomplishments and how public employees are living out a legacy of improving race and human relations. London, Jan 13 : George Lucas has revealed that he had to self-fund his movie, ‘Red Tails’, as he believes that Hollywood won’t support ‘an all black movie’. It took 20 years for Lucas to get his latest film made, which is the real story of a group of African-American pilots who fought in World War II. The event starts at 7:30 a.m. Friday at the Prime Osborn Convention Center. Doors open at 7 a.m. Parking is free. The Georgia Museum of Art at the University of Georgia has received a gift of prominent works by African-American artists from a collector couple who is also funding an endowment to support a new curatorial position. There are several great films and screenings happening this weekend in New Orleans two praised new films and two interesting documentaries. New York City is teeming with cultural offerings, so much so that it can be difficult at times to organize all of the things you want to do, see, taste and experience in Manhattan. Mama, I Want to Sing: The Next Generation, the revival of Mama, I Want to Sing the 1983 musical based on the life and times of singer Doris Troy will re-open at The Dempsey Theater . This season marks the 20th year that the New York Botanical Garden is holding its annual Holiday Train Show . Rules passed by the Commission at the November 17, 2011, Commission meeting require posting of a Drivers Bill of Rights as prescribed by the Taxi and Limousine Commission (TLC). As written in Sections 58-17(b)(3), 63-10(e), and 64-14(a)(5), all fleets, agents and taximeter shops must now post the Drivers Bill of Rights. This Industry Notice provides information regarding the form and format of its posting. The Bill of Rights is now available on the agencys website (www.nyc.gov/taxi). The Bill of Rights consists of two posters: one poster relates to fleet drivers and the other to driver-owned-vehicle (DOV) drivers. All licensed agents, fleets, and meter shops shall print, laminate or frame, and post the version (or both versions, if appropriate) of the Bill of Rights most appropriate for their business model or customer base. Each poster (fleet and DOV) shall be no smaller than 24 inches wide by 36 inches tall. Laminated or framed to protect from damage. Posted in plain sight near the payment window or other area where drivers regularly conduct normal and daily business transactions with the agent, fleet or meter shop. All agents, fleets and meter shops are required to comply with the provisions of this new rule no later than February 13, 2012. Licensees not in compliance after this date can be issued a summons and a fine up to $500. Any questions about posting the Bill of Rights should be directed to the TLC call center at 212-227-6324. To him from 1962 to 1970. Reflective, educational, uplifting or physical-here are the best ways to celebrate Martin Luther King, Jr. The City of Milwaukee and the UW-Milwaukee Zilber School of Public Health are teaming up for a new campaign they hope will lower the city’s infant mortality rate. A landlord wants the Ohio Civil Rights Commission on Thursday to reconsider its finding that she violated the law by posting a “white only” sign at her swimming pool. Harmon Carey, who heads the Afro-American Historical Society, stands in front of the Allied Kid Leather Co. The excitement was palpable as the crowd awaited Martin Luther King, Jr., in the packed sanctuary of Congregation Solel .A On that day in June, 1966, the civil rights leader was late-and as the diverse crowd waited for him, the tension mounted. Newly engaged queen of soul Aretha Franklin is headlining this summer’s Essence Music Festival in New Orleans, and its other top performers include Mary J. Blige, Fantasia, Stephanie Mills, Charlie Wilson, Keyshia Cole and others. Civil rights activist and former Memphis judge D’Army Bailey will speak Thursday at Vanderbilt University Law School in commemoration of the Rev.